Bringing the kids home from school in Pom Mahakan. I've gone back to Pom Mahakan a couple of times since we got back to Bangkok. There were more evictions in the fort while we were in the US but there are still 30-35 families living inside the walls of the old fort. 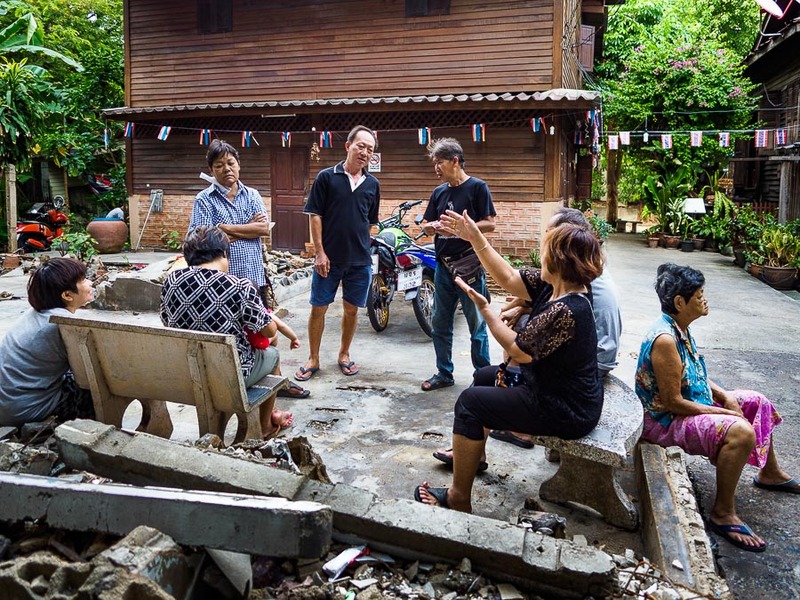 Bangkok authorities still plan to evict the other residents and build a park on the site. 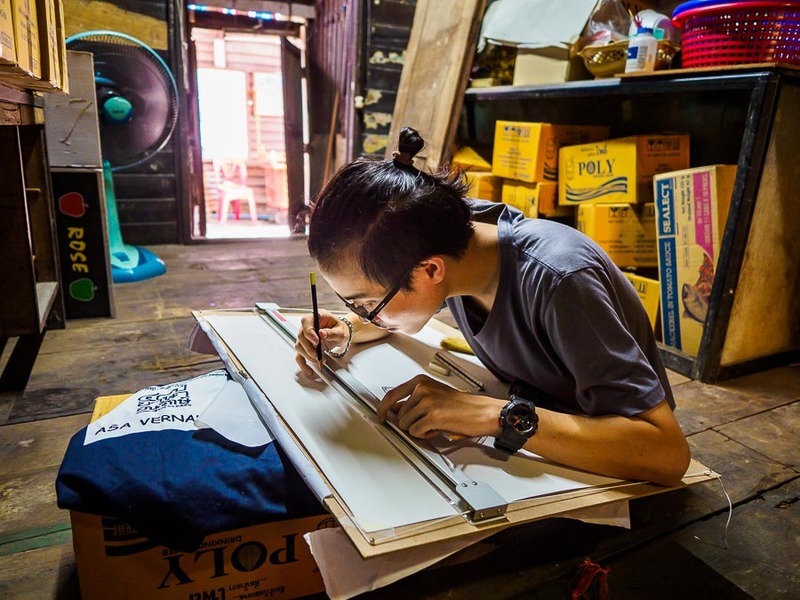 An architecture student sketches inside a home. The family that lived in the home was evicted in April but a few of their belongings are still in the house. There's a sort of ennui among the residents of the fort now. They know their time is short and there's nothing they can do about it. What is most distressing (for me anyhow) is that there's also no apparent time line. The final evictions could be next week. Or maybe next year. No one knows. At one point in April, while we were in the US, Bangkok media reported that city officials wanted to open the park this month (May, 2017). That seems optimistic but not impossible. 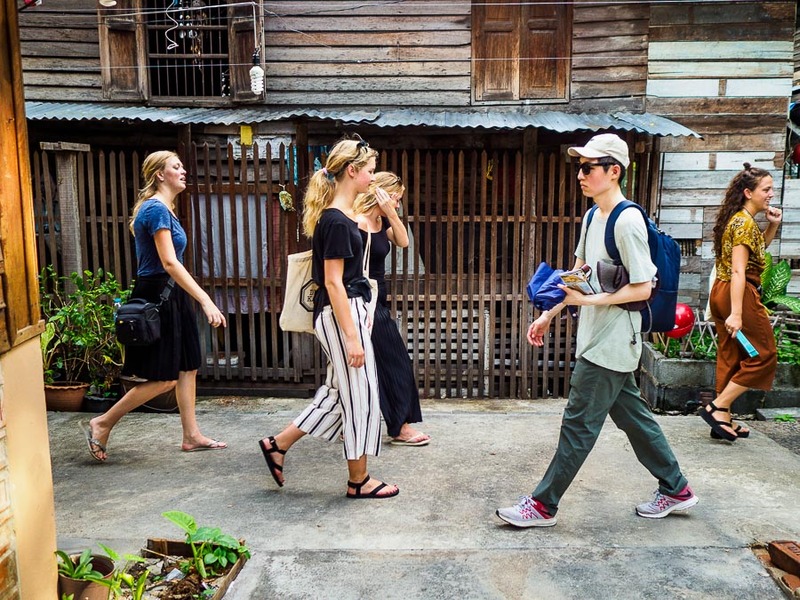 Tourists walk through Pom Mahakan. Interestingly, as Pom Mahakan's story spreads (there have been recent stories in the New York Times and other western news outlets) more and more tourists, both Thai and foreign, are coming down to the fort. An architect's group is busy making sketches of the historic homes before they're gone. It's like a closeout sale on history is taking place. And through it all, residents try to live their lives. 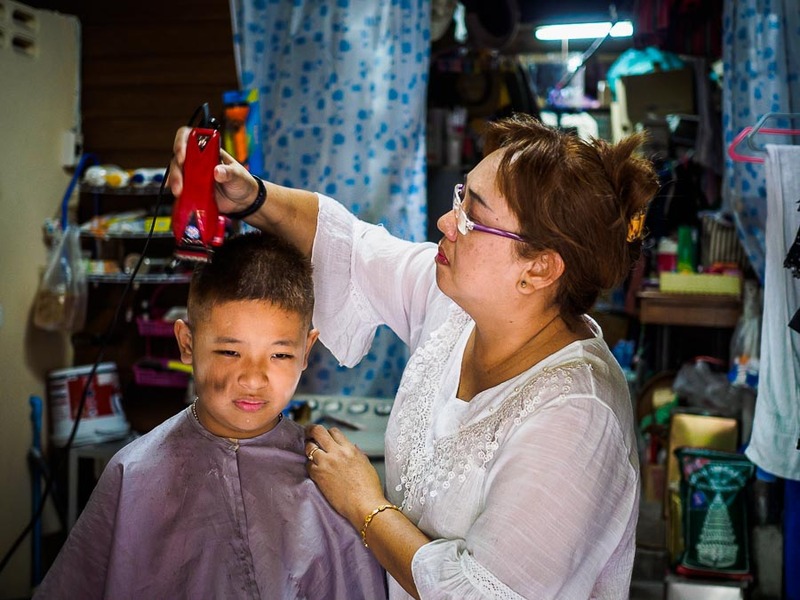 A back to school haircut in a home in Pom Mahakan. Thai schools' "summer" break is in April. The school year starts in May. Even as the residents hang on, the city is going ahead with the construction of the park. The debris of the homes torn down over the last nine months (about 1/3 of the homes in the fort have been demolished) has finally been removed. Some parts of the fort have been newly landscaped and there are piles of new dirt and potted plants awaiting construction crews. 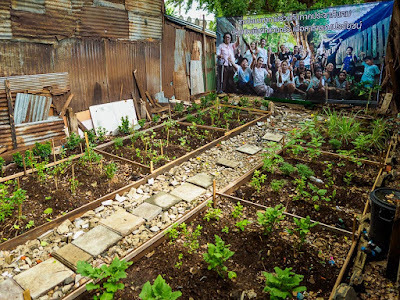 There's even a small community garden on the site of a demolished home. 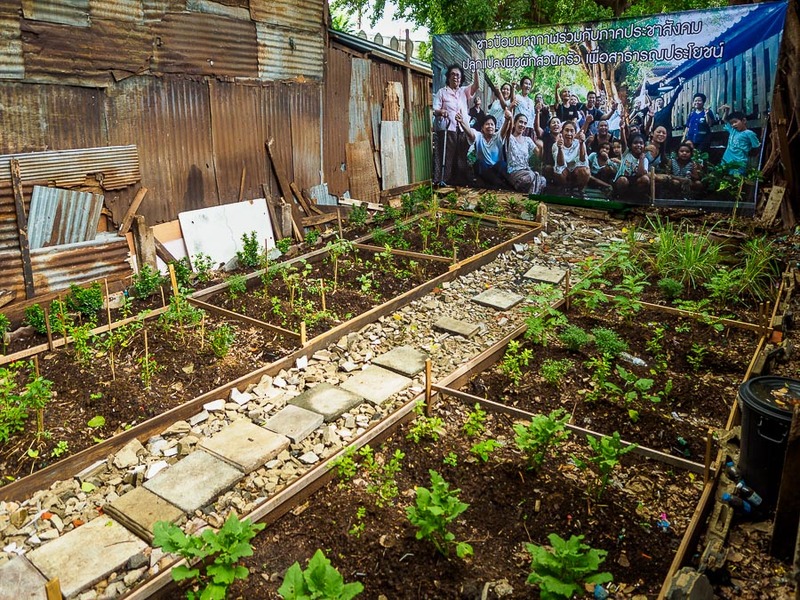 A new community garden on the site of a demolished home. The city government hung a PR photo at the back of the garden. Some of the old home sites have been turned into public space where residents gather to gossip in the evening, after the mid day heat has abated. People gather to gossip in the evening. There used to be two homes on this site. 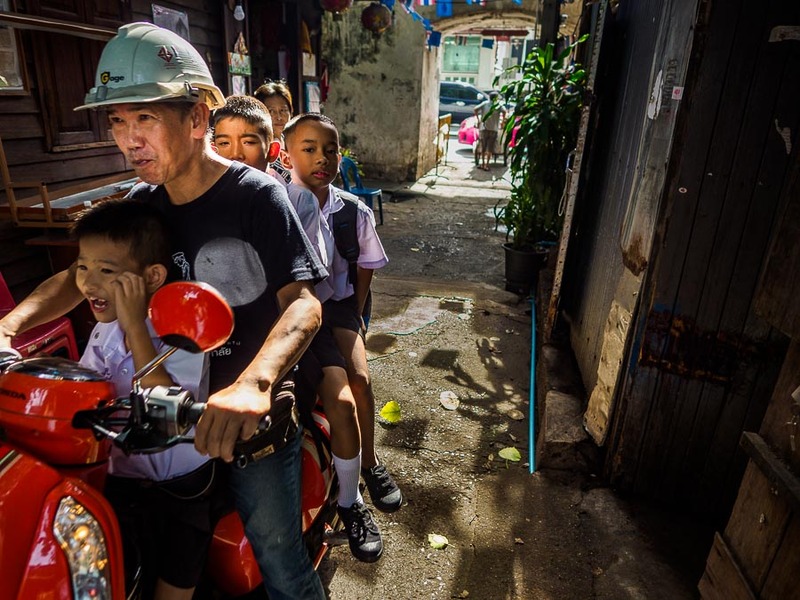 There are many more photos of life in Pom Mahakan in my archive.